ABOTA membership is by invitation only. Any trial lawyer who is of high personal character and honorable reputation and who is a member of the Bar of the State, province, district, territory or country in which he or she practices, and who also has met the qualifications as prescribed in Article III, Section 2 of the ABOTA Constitution may become a member of the American Board of Trial Advocates upon nomination, election, and payment of initiation fees and dues. The Foundation of ABOTA is to support the purposes of the American Board of Trial Advocates to preserve the constitutional vision of equal justice for all Americans and preserve our civil justice system for future generations. The Avvo Rating evaluates a lawyer's background and is calculated using a mathematical model which considers the information shown on the lawyer's Avvo profile, including years in practice, disciplinary history, professional achievements, and industry recognition.. Avvo.com rates ninety-seven percent of U.S. Lawyers and provides consumers with detailed information on attorneys and legal issues to help them make the choices that are right for them. Best Lawyers is the oldest and most respected peer-review publication in the legal profession. A listing in Best Lawyers is widely regarded by both clients and legal professionals as a significant honor, conferred on a lawyer by his or her peers. For more than three decades, Best Lawyers lists have earned the respect of the profession, the media, and the public, as the most reliable, unbiased source of legal referrals anywhere. Their lists of outstanding attorneys are compiled by conducting exhaustive peer-review surveys in which tens of thousands of leading lawyers confidentially evaluate their professional peers. If the votes for an attorney are positive enough for inclusion in Best Lawyers, that attorney must maintain those votes in subsequent polls to remain on the list for each edition. Lawyers are not permitted to pay any fee to participate in or be included on the lists. 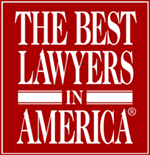 The U.S.News-Best Lawyers "Best Law Firms" rankings are based on a rigorous evaluation process that includes the collection of client and lawyer evaluations, peer review from leading attorneys in their field, and review of additional information provided by law firms as part of the formal submission process. Corsiglia McMahan & Allard, L.L.P. 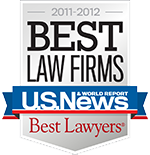 was honored by Best Lawyers and U.S. News & World Report with inclusion on the Best Law Firms list for 2011-2012. The Irish Legal 100 is compromised of some of the most accomplished and distinguished lawyers of the Irish descent from all across America. Lawyers are chosen from law schools, law firms, the Judiciary and industry. The Irish Legal 100 represents the vibrant Irish legal network and is designed to bring people together, foster modern relationships with Ireland, and to advance the interest of Irish America. In 2011, Corsiglia, McMahon & Allard, L.L.P. attorneys Timothy McMahon and B. Robert Allard were included in the The Irish Legal 100 list. LexisNexis® Martindale-Hubbell® has long set the standard for lawyer ratings. The company publishes the Martindale-Hubbell Top Rated Lawyers list of those who have achieved an AV® Preeminent™ Peer Review Rating which represents the highest rating in legal ability and ethical standards. AV Preeminent® (4.5-5.0 on the scale) is a peer-review system which is a testament that a lawyer's peers rank him or her at the highest level of professional excellence. The National Trial Lawyers promotes excellence in the legal profession through practical educational programs, networking opportunities, and legal publications which deal with current issues facing trial attorneys. This national organization provides networking opportunities, advocacy training, and the highest quality educational programs for trial lawyers. The National Trial Lawyers association promotes excellence in the legal profession through practical educational programs, networking opportunities, and legal publications that deal with current issues facing The Trial Lawyer. The Consumer Attorneys of California (CAOC) is made up of outstanding advocates who battle powerful interests and hold wrongdoers accountable while making life better for all Californians. The CAOC sponsors the “Street Fighter of the Year” Awards to highlight the work done by California legal practitioners. This award is given to a plaintiff's lawyer who has litigated a case that creates a more just society, regardless of personal benefit or financial gain. Pro-bono work and landmark cases that may not have produced a substantial financial verdict are given special consideration. In 2010, attorney Timothy McMahon was selected as a finalist for the Consumer Attorneys of California Street Fighter of the Year Award. Super Lawyers is a rating service of outstanding lawyers from more than 70 practice areas who have attained a high-degree of peer recognition and professional achievement. The selection process includes independent research, peer nominations and peer evaluations. Each year, the Super Lawyers list represents no more than 5 percent of the lawyers in the state. 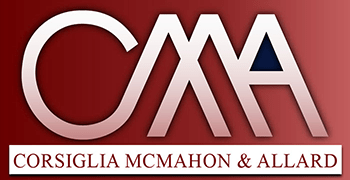 Multiple attorneys at Corsiglia McMahan & Allard, L.L.P. have been listed as Northern California Super Lawyers: Timothy McMahon (2008-Present), B. Robert Allard (2009-Present), Bradley Corsiglia (2011-Present), Lauren Cerri (2010, 2015), and Mark A. Sigala (Rising Stars in 2011, 2013-2014). Read more about Mr. McMahon's and Mr. Allard's inclusion in Super Lawyers. Trial lawyers work to ensure that any person who is injured by the misconduct and negligence of others can obtain justice in the courtroom, even when taking on powerful interests. The Santa Clara County Trial Lawyers Association (SCCTLA) member attorneys have an unwavering commitment to justice to ensure that every individual is on a level playing field in the courtroom and is able to hold wrongdoers accountable. The attorneys at Corsiglia McMahan & Allard, L.L.P. have been honored with the Trial Lawyer of the Year designation on multiple occasions: B. Robert Allard received the award in 2007, 2009, and 2012, and Timothy McMahon was honored in 2013. The Santa Clara County Bar Association provides education and support to member attorneys, advances the local administration of justice, and serves the public by fostering improved public understanding of and access to the legal system. SCCBA members for decades have had a reputation for the highest standard of professionalism in the practice of law. California State Bar applicants must pass a rigorous three-day examination, a test of their knowledge of the Rules of Professional Conduct, and a screening for moral character. The process is considered one of the toughest in the nation and is administered by the Committee of Bar Examiners (CBE). Maintaining the highest standards of the legal profession and ensuring the competent delivery of legal services are the highest priorities for the California State Bar.